Credit: By paalia on Flickr. Some rights reserved. The New York Times research and development lab was established in 2006 and is currently formed of seven engineers, tasked with monitoring and reacting to audience behaviour towards new technological trends. "The challenge is to secure our journalistic mission for the long term," said Matt Boggie, executive director of the NYT R&D lab, speaking at Sciences Po's NPDJ conference in Paris on Monday. "In the lab, we look at the broad trends on where technology is going, we follow industry news, then we come up with hypotheses and, finally, we create prototypes." Boggie said the things that have had the biggest impact on the news industry have "come from places we didn't think were going to be so important in the future of our business," such as social media. "That's why we try to look at all these different elements and aspects coming from the edges, to try and see what the future will be like." The lab's work revolves around innovation in news and developing new products, such as the recent NYT virtual reality app. the rise and evolution of the platform. Some of the prototypes developed by the R&D lab in response to these trends include Editor, a tool that automatically tags keywords in articles in real time and indexes the information across four categories: people, locations, organisations and concepts. It can also identify certain elements in a story that only a person would be able to recognise, Boggie said, such as a key point or an important quote, and this metadata could be reused for other digital products. Editor, an experiment in publishing from NYT R&D on Vimeo. 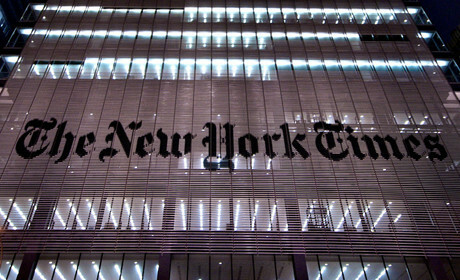 "The Times has been tagging all print articles according to people and location for over 100 years," he added. "But it doesn't tell us when people were mentioned or any of the metadata in that piece, so that we can do things like highlight a quote or identify when a person was first mentioned." By combining multiple trends such as data privacy, connected objects and personal/contextual interfaces, the R&D lab came up with a prototype for a modified piece of furniture called 'The listening table'. The table lets people drop a 'marker' during a conversation with a single tap and records what is being said, providing a written and audio transcription at the end. "We thought, 'what would it be like if a computer would be embedded in the room or in the furniture, that could augment the conversation you're having?'" "The table not only captures what you do, but also the context in which you do something, like a sensor for meaning," Boggie explained. The lab's work highlights the organisation's efforts to drive innovation both inside the newsroom and in its relationship with readers. Back in October, the outlet announced that it had passed a significant milestone, reaching more than one million digital-only subscribers. Later that month, NYT published an 11-page strategy memo, 'Our path forward', outlining its plans to double its digital subscription revenue by 2020 and become mobile-first. "We're hoping to achieve this growth in a few different ways, Boggie said. "At the moment, only 12 per cent of our audience contributes 90 per cent of our digital revenue. "We see our business as subscription-first and that doesn't mean we'll be giving up on advertising, but there will a shift in how we think of our readers and what they actually want from us."